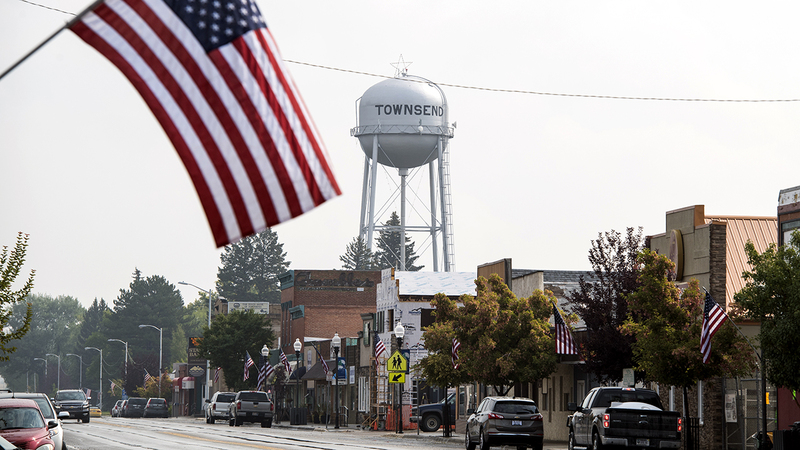 A narrow majority of U.S. adults (56%) say they are somewhat or very optimistic about what the country will be like in 2050, according to a new Pew Research Center survey. But optimism gives way to pessimism when Americans are asked about some of the specific ways in which the United States might change. Most Americans expect income inequality to worsen over the next three decades. Majorities say the economy will be weaker, the nation’s debt burden will be heavier, the environment will be in worse condition and health care will be less affordable than today. Most believe the U.S. will play a less important role in the world. About two-thirds predict that domestic political divisions will become more pronounced. Indeed, Democrats and Republicans have strikingly different priorities when it comes to the policies they believe would help improve the quality of life for future generations. Below are nine key findings from the survey, which was conducted among 2,524 U.S. adults in December 2018. 1 Most Americans expect income gaps to widen, and many see living standards declining. 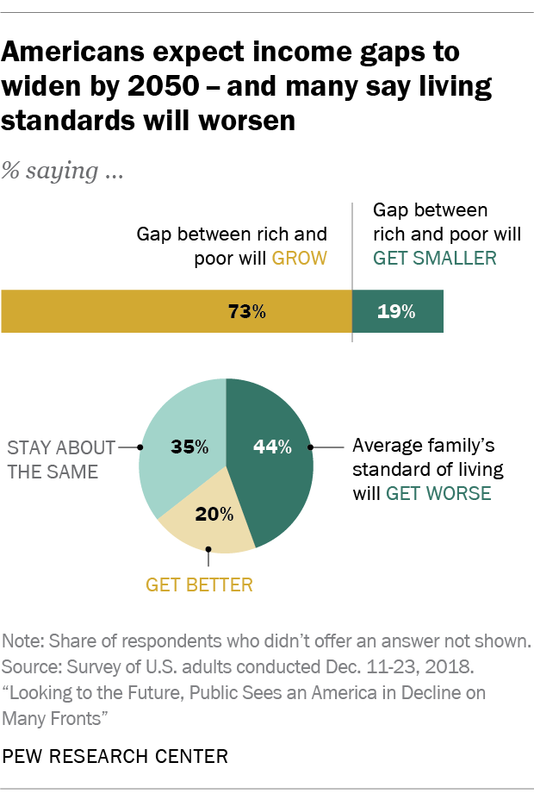 Roughly three-quarters of Americans (73%) say the gap between the rich and the poor will grow wider by 2050. This includes 75% of Democrats and Democratic-leaning independents and 71% of Republicans and GOP leaners – a notable area of agreement between partisans. While Democrats and Republicans agree that income inequality will grow by 2050, they disagree over the extent to which the federal government should prioritize reducing the gap between the rich and the poor. Roughly six-in-ten Democrats (58%) say this should be a top priority, but only about a quarter of Republicans agree (23%). More generally, the public is skeptical that the standard of living for average American families will improve in the future: 44% expect the living standard to get worse by 2050, about double the share who believe it will get better (20%). About a third (35%) believe there will be no real change. 2 The public sees tougher financial times on the horizon for older Americans. A majority of U.S. adults (57%) say those ages 65 and older will have a worse standard of living in 2050 than they do today. About seven-in-ten (72%) say older adults will be less prepared financially for retirement than their counterparts today. 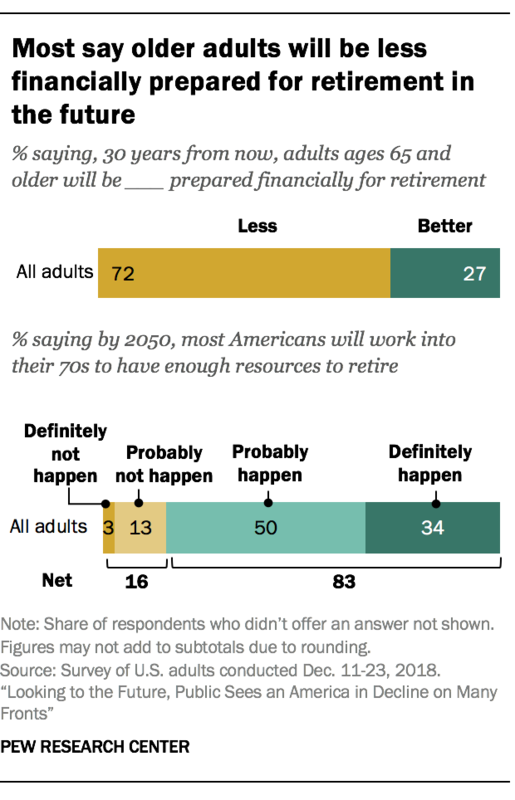 And an even larger share (83%) believes most people will definitely or probably have to work into their 70s to be able to afford retirement. Concerns about the Social Security system are widespread. Just 16% of U.S. adults who are not retired expect there will be enough money in the system to provide benefits at current levels in 2050. By contrast, 42% say there will not be enough money to provide any benefits at all and another 42% say benefits will be provided, but at reduced levels. Whatever their views about the viability of Social Security in the future, Americans are clearly opposed to a reduction in benefits. Roughly three-quarters of U.S. adults (74%) say Social Security benefits should not be reduced in any way, while only a quarter say some reductions for future retirees will need to be made. 3 A majority of adults are pessimistic about the environment, and many are worried about climate change. About six-in-ten Americans (59%) say the condition of the environment will be worse than it is now by the year 2050, 16% say it will be better and 25% say it will stay about the same. Democrats and Republicans have very different views: 70% of Democrats, compared with 43% of Republicans, say the environment will be worse. 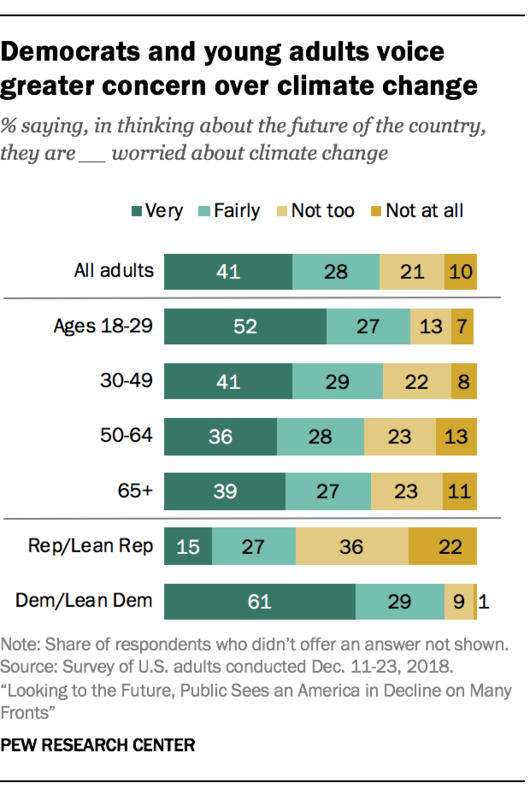 Roughly four-in-ten adults (41%) say they are very worried about climate change when they think about the future. Young adults are significantly more concerned about this than their older counterparts: 52% of those ages 18 to 29 are very worried, compared with 41% of those ages 30 to 49 and 37% of those 50 and older. 4Most Americans expect widespread job automation in the future, and few see this as a good thing for the U.S. Around eight-in-ten adults (82%) say, 30 years from now, robots and computers will definitely or probably do much of the work currently done by humans, though only 37% of employed adults say robots or computers will definitely or probably do the type of work that they personally do. Americans are far more likely to see widespread automation as a negative than positive development for the country. Among those who see this as likely, 69% say it would be a very or somewhat bad thing, while only 31% say it would be very or somewhat good. Around three-quarters of Americans (76%) say inequality between the rich and the poor would increase if robots and computers perform most of the jobs currently being done by humans, and a majority (66%) say it is unlikely that this kind of widespread automation would create many new, better-paying jobs for humans. 5 Americans are more likely to see the nation’s shift to “majority-minority” status as a good thing than a bad thing, but a plurality say it’s neither good nor bad. The Census Bureau projects that blacks, Hispanics, Asians and other racial and ethnic minorities will account for a majority of the U.S. population by 2050. About a third of U.S. adults (35%) say this change will be a good thing for the country, while 23% say it will be a bad thing. A plurality (42%) says it will be neither good nor bad. While most of the public sees a majority nonwhite population as either a positive or neutral development for the country, a greater share of adults say this change will lead to more conflicts between racial and ethnic groups (49% say this) than say it will lead to fewer conflicts (26%). The public is also more likely to say this shift will weaken American customs and values (38%) than to say it will strengthen them (30%). 6Large majorities expect a woman and a Hispanic person to become president by 2050. Around nine-in-ten (87%) say a woman will definitely or probably be elected president by 2050, while 65% say a Hispanic person will definitely or probably become chief executive. These views are held by majorities across parties and among most demographic groups. Nearly identical shares of Republicans and Democrats, for instance, say a woman will become president by 2050 (86% and 88%, respectively). 7Americans see a smaller role for the U.S. on the world stage. Six-in-ten adults say the country will be less important in the world in 2050 than it is today. The public is divided over how prominent China will be in the future: 53% say China will definitely or probably overtake the U.S. as the world’s main superpower, while 46% believe this definitely or probably won’t happen. 8Americans expect political divisions to intensify, and many are very worried about dysfunction in Washington. The public has very little confidence in the federal government or its leaders to deal with the challenges that lie ahead. About half of Americans (49%) say they are very worried about the way the government in Washington works, including 53% of Democrats and 45% of Republicans. A similar share (48%) say they are very worried about the ability of political leaders to solve the country’s biggest problems. Democrats are more likely than Republicans to be very worried about this (54% vs. 40%). In addition, 65% of adults say the U.S. will be more politically divided in 2050 than it is today, and this belief is held across partisan lines: 68% of Republicans say this, as do 62% of Democrats. 9Partisans have starkly different ideas about what steps the federal government should take to improve life in the future. 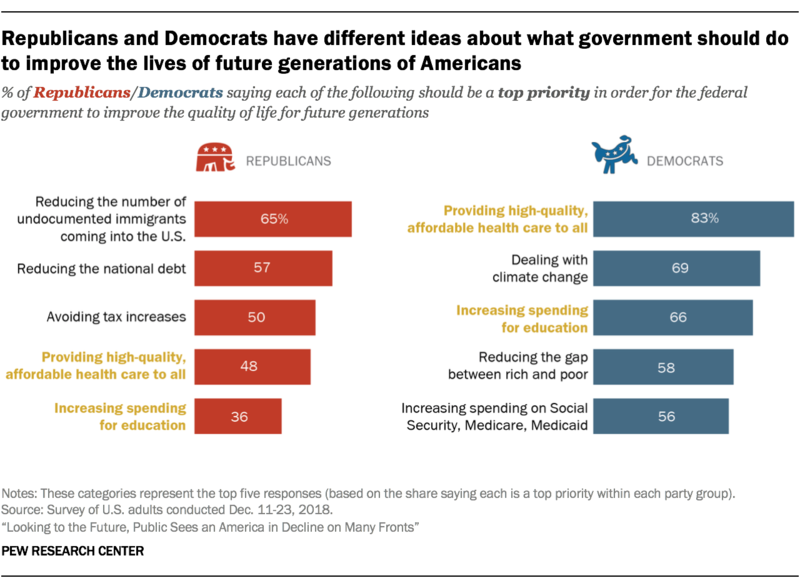 Democrats and Republicans differ notably in the policies they believe the federal government should enact to improve life for future generations. About two-thirds of Republicans (65%), for example, say reducing the number of undocumented immigrants coming into the U.S. should be a top priority for the federal government, but just 17% of Democrats agree. And while 83% of Democrats say providing high-quality, affordable health care for all should be a top priority, a much smaller share of Republicans (48%) agree.